This is 100% FREE and there are no conditions attached. You can continue after the free trial. We have a 100% customer satisfaction policy. If for any reason you are not satisfied simply email learningquranonline@yahoo.com and ask for a refund within 7 days of the invoice. You will receive an acknowledgement within 24 hours. Please email your complaints to learningquranonline@yahoo.com – Insha ALLAH we will respond within 2 days maximum. 2. Fees are calculated on an monthly basis, taking into account public holidays, and so there is no reduction in fee for weeks which include public holidays. If you ask us to provide goods or services to you, we will use your information to provide those goods or services to you and to monitor our provision of those goods or services. We may also share your information with associated companies for marketing purposes. We or associated companies may contact you by mail, telephone, fax, email or by other electronic means with offers of goods and services or information that may be of interest to you. By providing us with your fax number, telephone numbers or email address you consent to being contacted by these methods for these purposes. If you do not want to receive marketing information from us or associated companies you can notify us of this as part of the registration process. You can stop receiving this information at any time by following the unsubscribe instructions on the correspondence you receive, by amending your marketing preferences, or by emailing learningquranonline.com , giving your email address and details of the information you no longer wish to receive. 4. Our email newsletters: If you subscribe to receive one or more of our email newsletters you will need to register an account with us. We will provide those newsletter(s) to you free of charge. Our newsletters may contain promotions or advertisements relating to goods or services provided by us or our group companies and associated third parties from time to time. If at any time you wish to unsubscribe from an email newsletter you may do so by following the unsubscribe instructions on the newsletter, on the Website, or by emailing learningquranonline.com , giving them your email address and details of the newsletter you no longer wish to receive. 6. Disclosure to third parties: We will only pass your information on to associated third parties for the purpose of enabling them to send you information which may be of interest to you if you have indicated you are happy for us to do so in your marketing preferences. Don’t worry – we only ever pass on your contact details to third parties with your permission. If any third party is organising and/or managing any promotion, competition, survey or poll run through the Website on our behalf, we may disclose your information to that third party to enable them to do so but they will be prohibited from using your information for any other purpose, unless you have given them specific consent. 7. Forums, chat rooms, blogs, message boards: Please be aware that when you post public information to any forums, chat rooms, blogs, or message boards on or through the Website, that information can be accessed by the public and used to send you unsolicited communications. 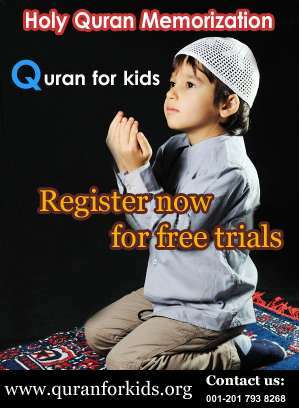 Http://quranforkids.org accepts no responsibility for this. 8. Cookies: The Website automatically gathers certain information such as IP addresses and the number and frequency of visitors to the Website and individual web pages. Cookies are pieces of information that are stored by the browser on the hard drive of your computer. Cookies can be deleted from your hard drive or you can configure your web browser so that it rejects cookies. This is collected using cookies and is used by us, for security and monitoring purposes, to manage the Website, to track usage, to improve the Website and to ensure the Website is as appealing to visitors as possible. To learn more about cookies and how to reject them, visit https://www.aboutcookies.org/. Rejection of cookies will not prevent you from using most of the features on the Website. If you experience any problems having deleted cookies, you should contact the supplier of your web browser. 9. Third party sites: The Website contains links to third party websites. We may, on occasion, disclose non-personal aggregated information to the owners or providers of those third party websites. We link to a wide variety of other websites and we display advertisements from third parties on our Website. We are not responsible for the content or privacy policies of these websites or for third party advertisers, nor for the way in which information about their users is treated. In particular, unless expressly stated, we are not agents for those sites or advertisers nor are we authorised to make representations on their behalf. 10. Security: In accordance with our requirements under the Data Protection Act 1998, we will adopt appropriate security procedures to help prevent unauthorised access to your information. Neither learnQuranOnline nor any of its group companies shall be liable for any attempt to hack or crack or otherwise gain access to any part of this Website including any of your information. 13 . Contact details: you can contact us at our email learningquranonline@yahoo.com or call us at our 24/7 number +1 201-793-8133 for any queries.